Rob and Phyllis are back in the Fantasmo Lounge to discuss Roger Corman's film, Humanoids From The Deep. This isn't your typical creature film folks. Don't forget to join in the conversation on the Fantasmo After Dark Facebook Page and check out the photo album for this episode! Rob and Phyllis are in the Fantasmo Lounge to discuss The Lost Skeleton of Cadavra. Grab a drink and join us. "Tip, tip, tip, tip". Join in the conversation and check out the photo album for this episode on the Fantasmo After Dark Facebook page. Before Captain Spaulding there was the Tourist Trap. Join Rob and Phyllis in the Fantasmo Lounge as they discuss this film and other real roadside attractions. Don't forget to check out the Fantasmo After Dark Facebook Page for pictures from this episode and to join in on the conversation. In this episode Rob and Phyllis are back in the lounge to discuss the often overlook 1976 Blaxploitation film, JD's Revenge. Is it horror? Is it a crime drama or action flick?. Listen to this episode and you decide. As always, be sure to check out the Fantasmo After Dark Facebook Page to join in on the conversation and to the check out the photo album for this episode and any clips or trailers Rob finds to post. Rob and Phyllis are in the Fantasmo Lounge to discuss the 1977 film, The Sentinel. It's a little bit "old dark house" and a little bit demon possession...ish. Take a listen and you decide. Join in the conversation and check out the pictures from the this episode on the Fantasmo After Dark Facebook page. Rob and Phyllis are back in the Fantasmo Lounge to discuss the 1963 film, The Haunting. Join us, won't you? Don't forget to check out the Fantasmo After Dark Facebook Page for pictures and clips from this episode. Feel free to join in the conversation about this old dark house film on the facebook page as well! Rob and Phyllis are in the Fantasmo lounge to discuss one of their favorite movies, The Adventures of Buckaroo Banzai Across The Eighth Dimension! If that's not enough to get you to listen, we can't be friends. Join in the conversation on the Fantasmo After Dark Facebook Page and check out the photo album for this episode. Rob and Phyllis are back in the Fantasmo Lounge to discuss the 1981 Australian film, Road Games. Join us, won't you? 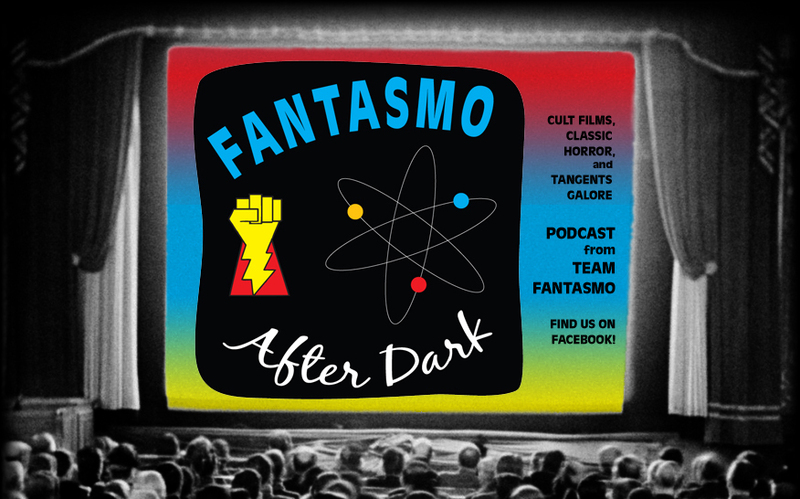 Join in the conversation on the Fantasmo After Dark Facebook page Also, check out the album for this episode. Join Rob and guest co-hosts, Tony Mercer, and Sam Batman in a special "cabin lounge in the woods" edition. They are discussing the when and why horror movie settings moved from the traditional gothic (Dracula or Frankenstein) to the more pastoral (Texas Chainsaw Massacre or Halloween). Don't forget to check out the Fantasmo After Dark Facebook page for pictures from this episode and join in on the conversation. There's no lace and very little blood, but that doesn't stop us from watching and discussing Blood and Lace in the Fantasmo Lounge. Join us, won't you? Be sure to join in the conversation and check out the pictures and youtube link on the Fantasmo After Dark Facebook Page.